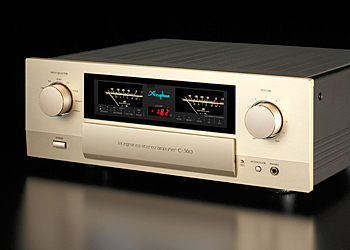 The E-360 represents a full model change from the E-350, incorporating the AAVA volume control and other sophisticated technological know-how gained by Accuphase over the years. Only strictly selected high-grade materials and parts are used, resulting in an integrated amplifier that brings out the full potential of every source, for a truly enchanting musical experience. AAVA is a revolutionary principle that redefines the concept of volume control from the ground up. Unlike the digital approach involving A/D and D/A processing, it operates purely in the analog domain for high performance and ultimate sound. Because the music signal does not pass through any variable resistors, it is not subject to the adverse effects of impedance changes. Adjusting the volume level is accomplished practically without altering the sonic quality. As the amplification and volume control tasks are integrated in a single electronic entity without any variable resistors, performance and sonic purity do not deteriorate over the years, providing excellent reliability. The selected volume level is clearly shown by the numeric display in the center of the front panel, allowing the user to set precisely the desired level every time. The power amplifier section is built as an advanced instrumentation amplifier, which enables fully balanced signal transmission throughout. Together with the highly acclaimed current feedback principle, this makes for even better electrical characteristics. In the output stage, high-power audio grade transistors are arranged in a parallel push-pull configuration which significantly enhances drive capability of low-impedance loads.